The market risk premium is the additional return an investor will receive (or expects to receive) from holding a risky market portfolio instead of risk-free assets. The market risk premium is part of the Capital Asset Pricing Model (CAPM)Capital Asset Pricing Model (CAPM)The Capital Asset Pricing Model (CAPM) is a model that describes the relationship between expected return and risk of a security. CAPM formula shows the return of a security is equal to the risk-free return plus a risk premium, based on the beta of that security which analysts and investors use to calculate the acceptable rate of return. At the center of the CAPM is the concept of risk (volatility of returns) and reward (rate of returns). Investors always prefer to have the highest possible rate of return combined with the lowest possible volatility of returns. 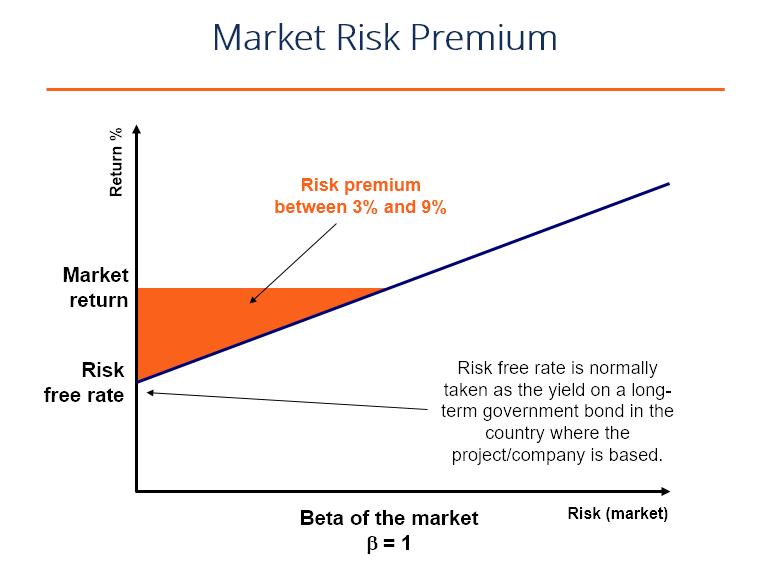 Required market risk premium – the minimum amount investors should accept. If an investment’s rate of return is lower than that of the required rate of return, then the investor will not invest. It is also called hurdle rateHurdle Rate DefinitionA hurdle rate is the rate of return that must be achieved before accepting and funding an investment project. Hurdle rates are used in financial modeling to calculate NPV. If IRR > Hurdle Rate then the investment creates value. The rate is determined by assessing the cost of capital, risks involved, opportunity cost of return. Historical market risk premium – a measurement of the return’s past investment performances taken from an investment instrument that is used to determine the premium. The historical premium will produce the same result for all investors as the value’s calculation is based on past performances. Expected market risk premium – based on the investor’s return expectation. The required and expected market risk premiums would differ from one investor to another. During the calculation, the investor needs to take the cost of equity it takes to acquire the investment into consideration. With a historical market risk premium, the return will differ depending on what instrument the analyst uses. Most analysts use S&P 500 as a benchmark for calculating past performance. Usually, a government bond yield is the instrument used to calculate risk-free assets as it has little to no risk. S&P 500 generated a return of 8% the previous year, and the current rate of the Treasury billTreasury Bills (T-Bills)Treasury Bills (T-Bills) are a short-term financial instrument that is issued by the U.S. Treasury with maturity periods ranging from a few days to 52 weeks. They are considered the safest debts since they are backed up by the full faith of the Treasury Department of the United States Government. When an investor buys is 4%. The premium is 8% – 4% = 4%. An asset with zero risk, and therefore zero beta, for example, would have the market risk premium canceled out. On the other hand, a highly risky asset, with a beta would 0.8, would take on almost the full premium. At 1.5 beta, the asset is 150% more volatile than the market. It’s important to reiterate that the relationship between risk and reward is the main premise behind market risk premiums. If a security returns 10% every time period without fail, it has zero volatility of returns. If a different security returns 20% in period one, 30% in period two, and 15% in period three, it has a higher volatility of returns and is therefore considered “risker”, even though it has a higher average return profile. This is where the concept of risk-adjusted returns comes in. To learn more, please read CFI’s guide to calculating The Sharpe RatioSharpe RatioThe Sharpe Ratio is a measure of risk adjusted return comparing an investment's excess return over the risk free rate to its standard deviation of returns. The Sharpe Ratio (or Sharpe Index) is commonly used to gauge the performance of an investment by adjusting for its risk..
We hope this has been a helpful guide to understanding the relationship between risk and reward in corporate finance. CFI is the official global provider of the Financial Modeling and Valuation Analyst (FMVA) certificationFMVA™ CertificationThe Financial Modeling & Valueation Analyst (FMVA)™ accreditation is a global standard for financial analysts that covers finance, accounting, financial modeling, valuation, budgeting, forecasting, presentations, and strategy. program. To keep learning more about corporate finance and financial modeling, we suggest reading the articles below to expand your knowledge base.